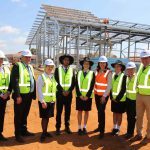 Construction of Wilsonton State High School’s new $5.7 million multipurpose hall in Toowoomba is due to be completed by the end of the year. Today Wiley hosted Premier Annastacia Palaszczuk & Education Minister Kate Jones at Wilsonton State High School. Together with Wiley Senior Project Manager, Zane Bennett, the pair inspected progress on the construction of the new multipurpose hall, which is being delivered under the $200 million Advancing Queensland Schools program. “This has been a momentous year for the School. Previously, the school has been a campus of Toowoomba State High School. It’s now Wilsonton State High School in its own right,” said the Premier. 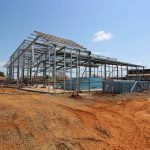 Wilsonton State High School Principal Marcus Jones said that the new multi-purpose hall would allow the school to offer a broader range of activities in a modern, purpose-built facility. 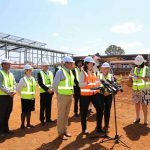 “The school community has been calling for this hall for many years and I am delighted to see construction underway,” Ms Palaszczuk said. Ms Jones said the Government had fast tracked construction of this hall through our Advancing Queensland Schools program to ensure it would be in time for the start of school next year. 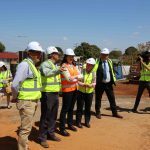 “The project will also create training opportunities for local apprentices ensuring we are building the skills of Queenslanders,” she said. “We are also investing in the future of our schools and delivering the facilities our students and teachers need to make the most of their education. “The students are excited to see the progress on the new hall and can’t wait to use the facility next year,” Mr Jones said.